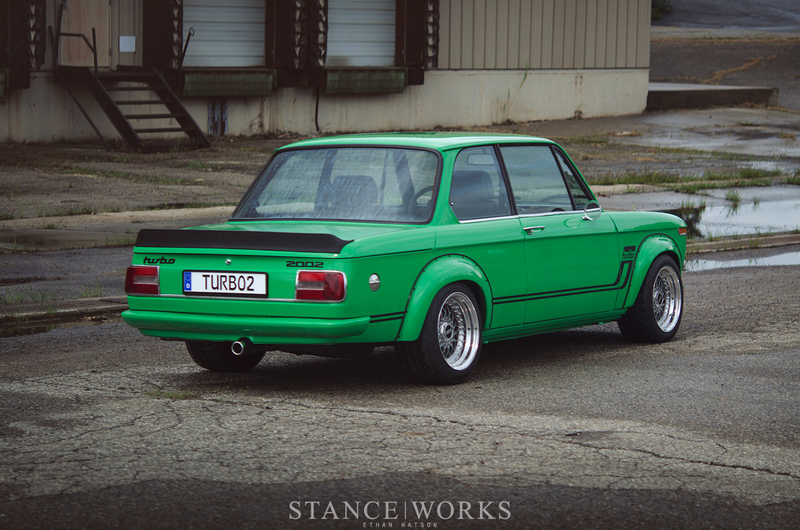 It was in '73 that BMW brought the 2002 Turbo to the market - but just one year prior, BMW unveiled the "Turbo Concept." In many ways, it was an M1 predecessor, and is, to this day, still seen by most as the father to the mid-engined legend. Styling cues from the prototype made their way to the M1, the 8-series, and even the lesser-known Z1. However, under Paul Bracq-penned Turbo Concept's skin is something far more relevant to our story. Underneath the futuristic styling, drawn-out lines, and radical ideas that comprised the Turbo Concept was a modified 2002 chassis. Changes were made to convert the car to a mid-engined layout, and behind the driver sat an engine that, after several iterations and stages of evolution, would become one of motorsport's most jaw-dropping engines ever built. Rewinding a bit further, the Turbo Concept was unveiled at the 1972 Paris Motor Show, and was built in part to celebrate the 1972 Summer Olympics in Munich, Germany. 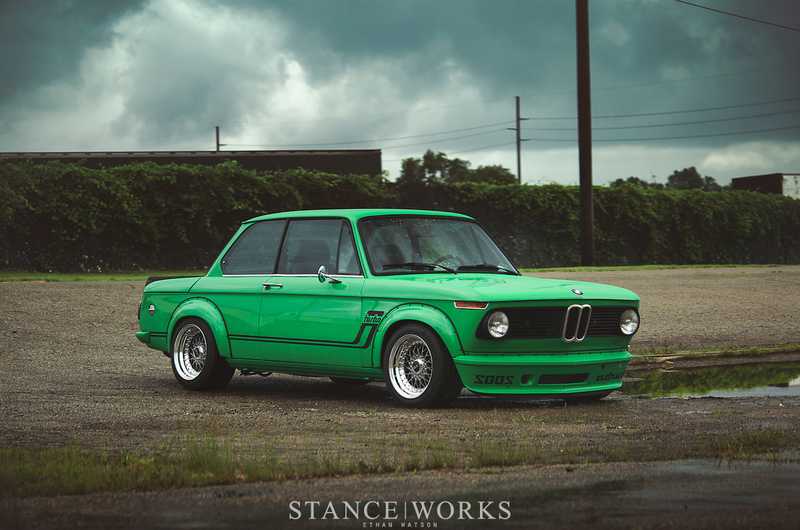 However, aside from the celebratory nature of the car, the brainiacs at BMW had more important motives with the unique wedge-shaped steed. For the keen, the car's name has already told the story - BMW's mission was to unveil their first steps into the deep, dark forest of turbocharing technology. The company had never utilized a turbocharger on a road-going automobile before, the the Turbo Concept was there to tell the world that BMW was in many ways ready to make the leap. Under the sleek, molded rear panel of the Turbo was, shockingly, a turbocharged M10 - a 2.0-liter lump pulled from the 2002 the chassis was based on. It's suggested that the concept car's inline four pushed about 200 horsepower past the flywheel, and while the Turbo Concept was likely never driven to the brink, as only two exist, there's no question that a group of engineers knew exactly what needed to happen. The following year, BMW announced the 2002 Turbo - a light, nimble, smile-inducing car paired with the heart they had created 12 months prior. The engine was detuned, albeit only slightly, settling at 170 brake horsepower - more than enough for the '02. The engine in and of itself was noteworthy in many ways: it was the first production turbocharged engine built in all of Europe, giving BMW yet another claim to fame in its very long tally. The M10's basics remained the same, a 1,990cc configuration with two valves per cylinder - but the accessories and mechanics that made the wheels turn faster is where things got interesting. The 2002 Turbo was fueled via a Kugelfischer mechanical fuel injection system, which was tuned to keep up with the KKK BLD turbocharger, yet kept in check with a compression ratio that was dropped to just 6.9:1. It was an amalgamation of parts that created some serious power for its time; however, it came at a cost. The 2002 Turbo was notorious for its turbo lag, an effect caused by the low compression and choice of turbo given the engine's displacement. The outcome was a car that, to many, was immeasurably fun yet more than a handful to drive. Boost didn't adequately build until almost 4,000 RPM, but when it did, the nut behind the wheel needed to be focused: the '02 Turbo was ready to take off. Now, 40 years later (and that's sure to make any readers born in '72 feel mighty old), the '02 Turbo has reached the status of Automotive Icon. The leaps in engineering taken by BMW, as well as the leap of faith in creating such a fun-spirited car, has established, in many ways, what classic motoring and BMW heritage stand for. 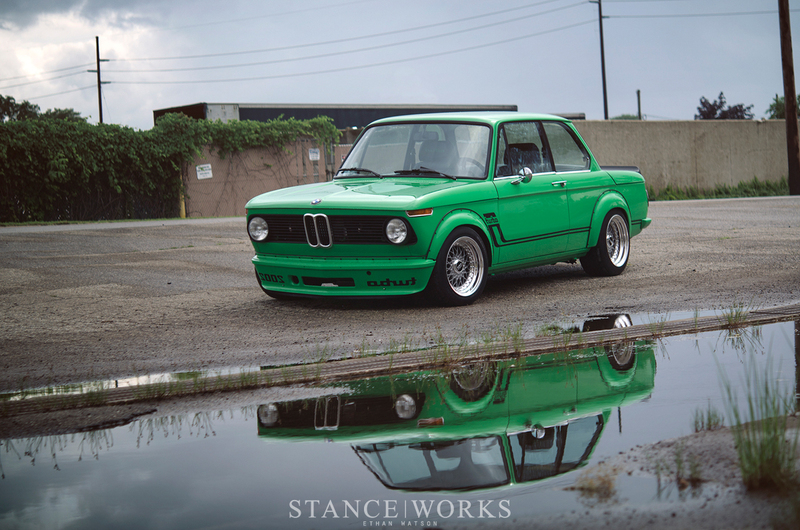 The 2002 Turbo is a car that any and all BMW nuts find themselves drooling over. The countless touches that make the car so unique, from the bulged fender arches to the mirrored air dam script - they all stand as tidbits that make the 2002 Turbo truly separate from any other New Class BMW built. But can the spirit of such a car be improved? A car that straddles the boundary between comfort and practicality versus mindless fun - could that be taken even further? 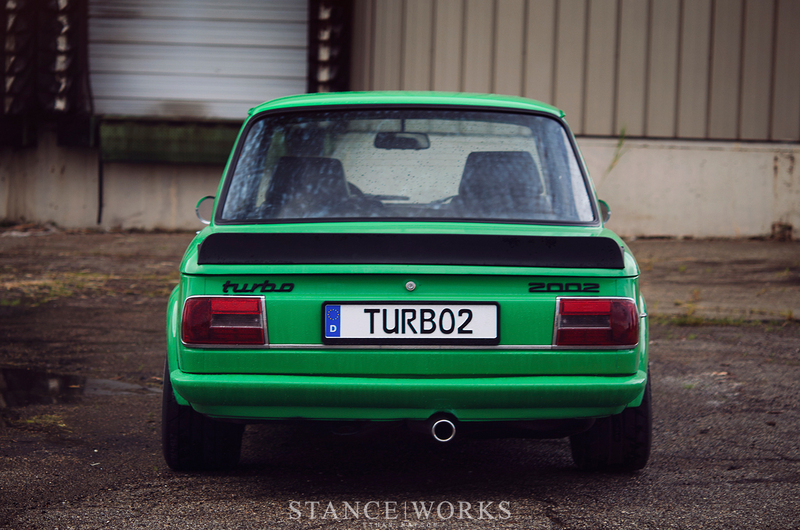 Eric Heffernan and his father took on a project of their own, creating their own version of the 2002 Turbo that speaks to the heart and soul of the original. The essentials are all present: the hardware-attached classic "turbo" arches are perched atop the fenders, with the sides of the car accentuated by a mono-chromatic take on the Turbo's classic striping. The front air dam hangs low, and the reversed "Turbo 2002" text is still in place to let the common man know what car is about to pass him from his rear-view mirror. Yet, more important than the essentials is the slew of details and mountain of effort Eric and his father have put into this car to make it their own. It's impossible to ignore, first and foremost, the electric color of choice. 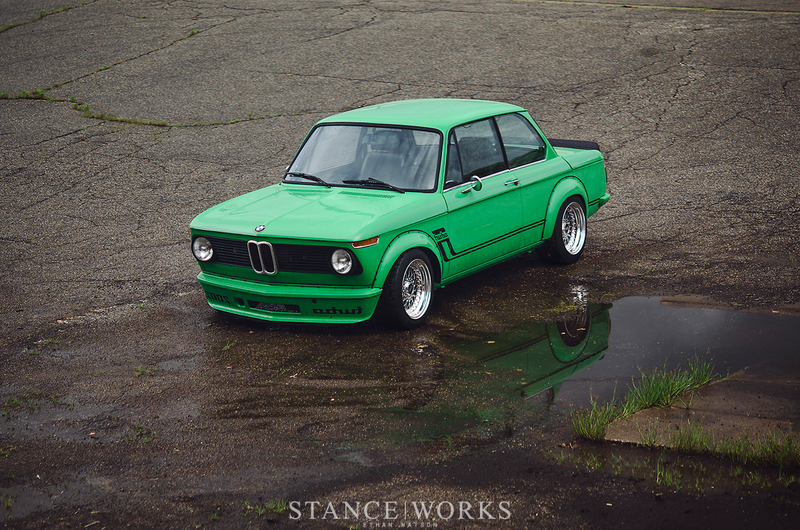 BMW originally only offered the 2002 Turbo in two colorways: Polaris Silver and Chamonix White; however, instead, Eric chose Porsche Signal Green, which seems to radiate from every panel - yet the quirky color fits in a way that harks to the technicolor brilliance and explosion of color during the '60s and '70s. 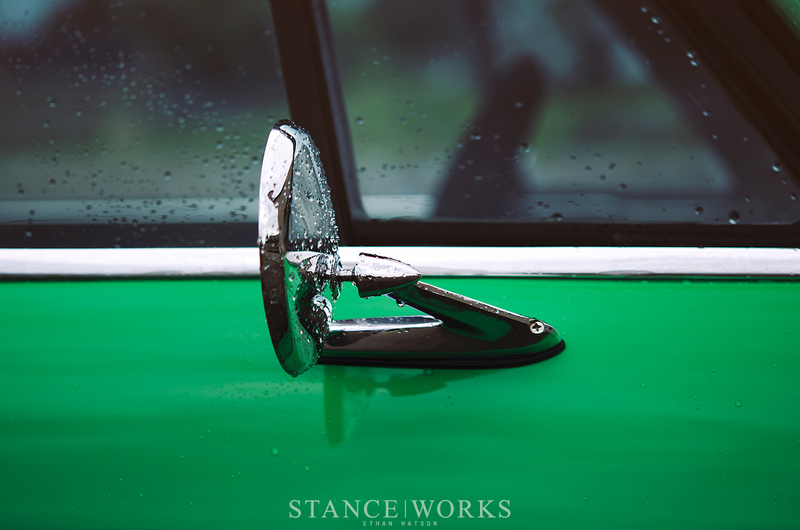 The striking green ensnares the attention of any wandering eyes - at first I found myself wondering what kind of loud-mouth creation I was looking at - and before I knew it, I was in love with vibrant-yet-pastelish "deuce." The energetic paint is hardly an afterthought. Inside, hints of matching pigment trace the interior that Eric had entirely redone. 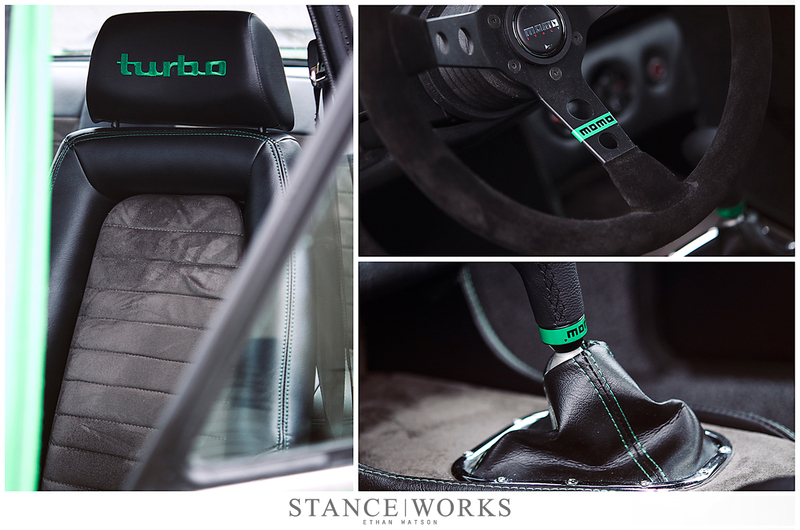 Embroidered in the headrests of the vintage Recaro Sports is the classic "turbo" badge from the tail of the car, stitched in a matching green. Tracing the edges of the leather is matching stitching, which follows the lines of the seat, and on to the leather-wrapped center console. The black-and-grey leather-and-suede theme of the seats matches the re-done door cards, creating a new and cohesive aesthetic throughout the inside of the cabin. Finishing details, such as an Signal Green Momo logo around the black suede steering wheel and shift knob, bring the interior and exterior together in a perfect modernization of the iconic '02 Turbo. Hunkered under the arches is a rebuilt and refinished set of 15x8.5 and 15x9 BBS RSs, wrapped in 225/45/15 Hankook RS3 tires. Polished lips and centers that hint of Nagaro Silver fit perfectly and call to classic styling, keeping the vibrant nature of the surrounding panels in check. More important than the aesthetic, however, is how the sizable tires help complete the turbo package. 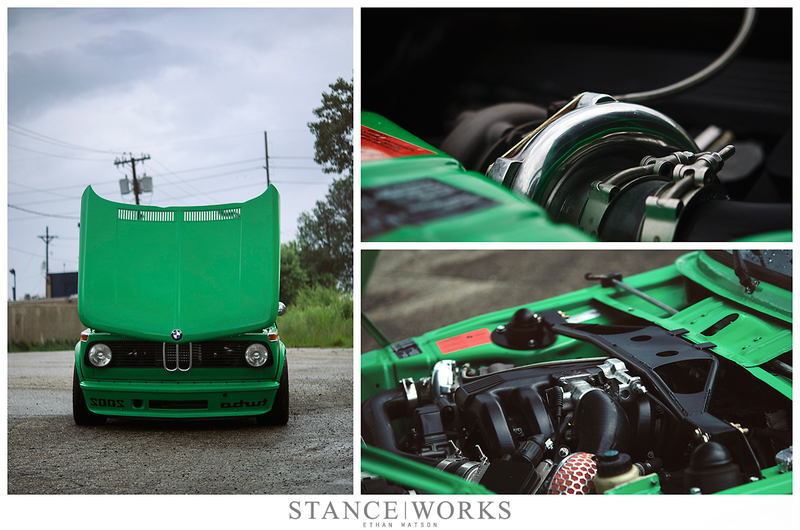 Embracing the idea of what made the 2002 Turbo so spectacular, Eric built his own turbocharged variant. Utilizing an M42 as the basis for the build, it stays near and dear to the 2.0L heart of the original Turbo. The slightly lower displacement of 1.8 liters is counteracted with the pairing of a Super60 turbocharger, which, in unison with the slew of other parts, yields a transplant that pumps out around 200 horsepower - faintly familiar from the days of the Turbo Concept. The little green 02's power is reserved yet usable, running only a half bar of manifold pressure. The power is routed to the rear of the car through a 5-speed transmission, and to really get the wheels spinning, a 3.91:1 limited-slip rear end. To make the most of the featherweight heart, the car received a complete suspension overhaul. Supporting the car is a set of tried and true Bilstein struts and H&R springs. Sway bars front and rear, as well as strut braces, stiffen up the chassis and handling, helping the Hankooks to bond a bit closer with the tarmac. 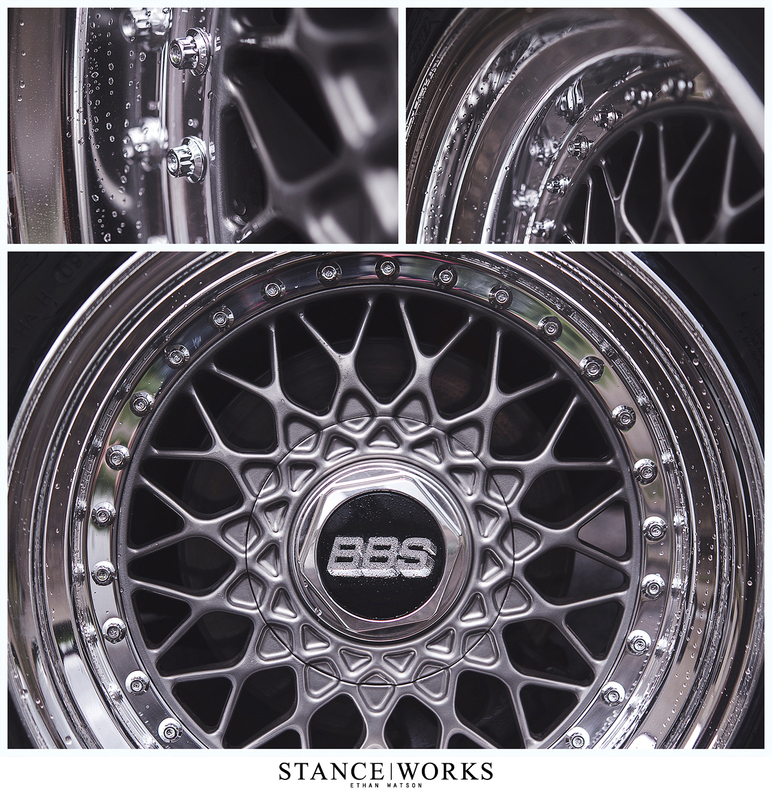 Stopping power wasn't forgotten either - up front, the factory discs were replaced with a Wilwood big brake kit, and out back, the factory drums were tossed in favor of a disc conversion. It's as though no detail was forgotten or spared. 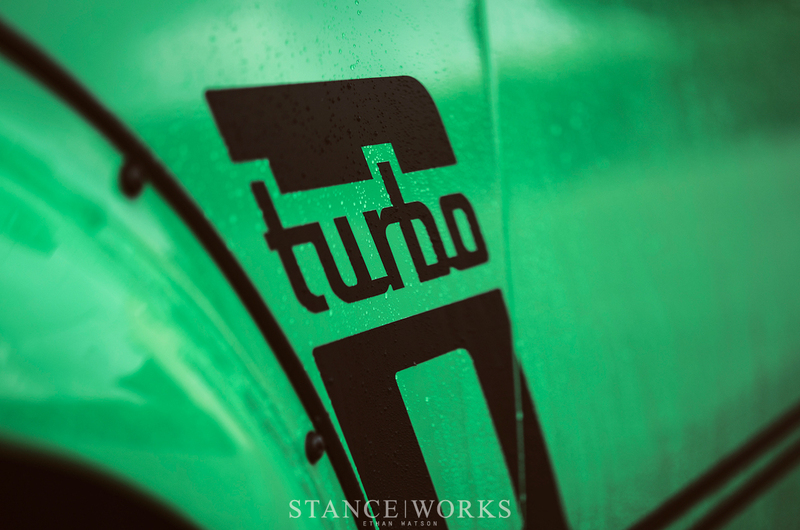 While it's far from what the orignal 2002 Turbo was, Eric Heffernan's own creation cheers in celebration of what the 2002 Turbo could potentially be. 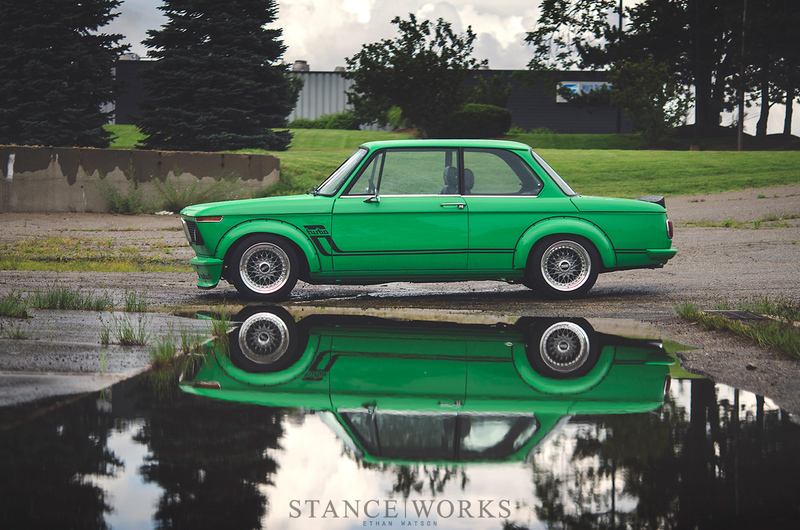 He and his old man have taken what makes the iconic car so special, and instead of commemoration, replication, or preservation, they've taken the heart, soul, and spirit of the 2002 Turbo and transformed it into something entirely their own. Nonetheless, there's still much of the '02's history to be discussed; our 2002 History Lesson is far from over. @johnluber Really? How many 02s have you seen? Very nice work, S/W. I love the fact that the owner keep it to a reserved yet responsive 200hp. With legends like the 2002, power should share the spotlight with everything else that makes the car great. DAMN ! 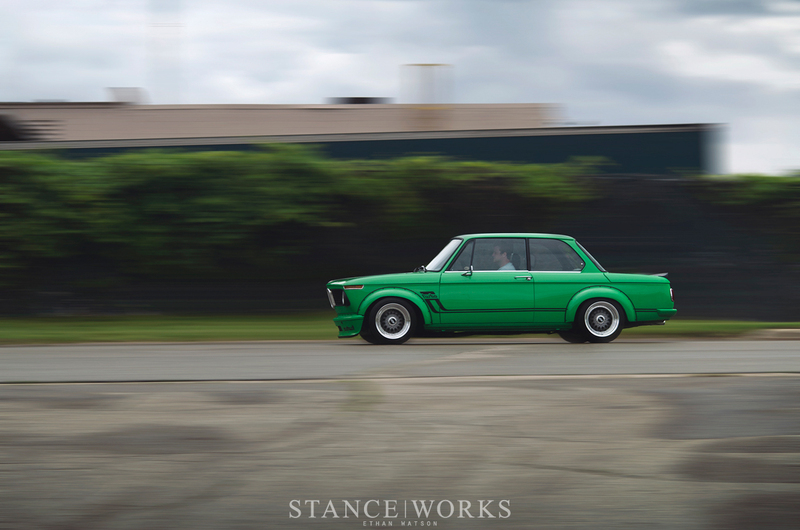 what a good lookin ride, i love the color !